The sharp eyed amongst you will notice that those aren't GW nags that the boys are riding and you'd be right. They are in fact from Front Rank mini's and I've painted hundreds of them over the years, hasn't made me like painting horses any more than I used to but there you go. I also did a couple of head swaps to break up the ranks a little bit. I decided to do three different horse colours, I think I'm right in calling them Black, Dun and Piebald. 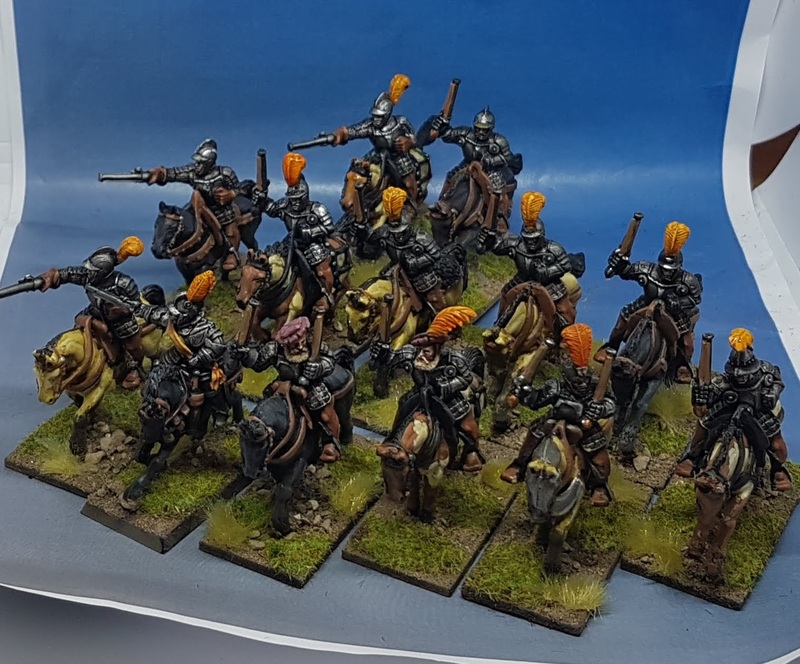 I reasoned that the Reiters wouldn't have access to the top rank of horse flesh so a good mix of horse colours will add to their overall look. The officer is from Casting Room miniatures which is a sub company of foundry. I'm not a fan of all their figures but they have some that are useful within their ranges. 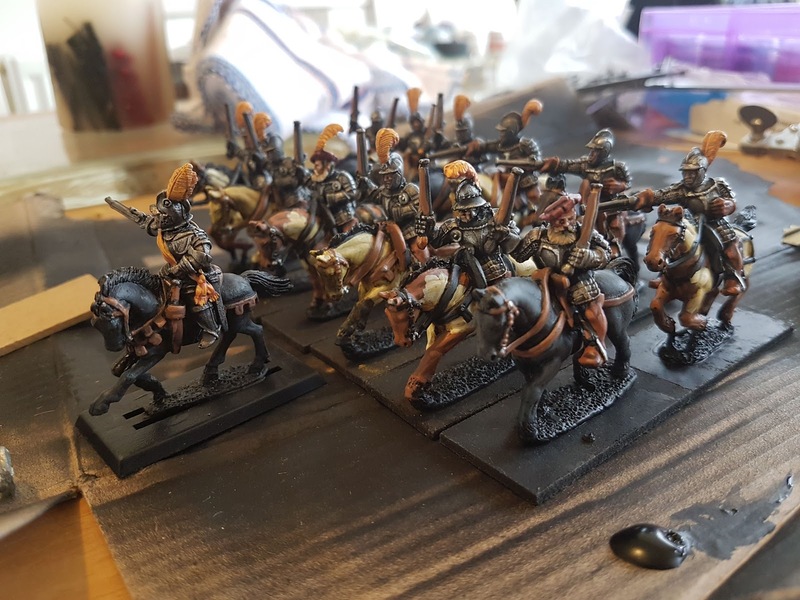 I got the whole unit done in a couple of days (the wife and kids had gone out for an afternoon so I had some time to myself! Whoop!). With this group done it gives me 24 Pistoliers with a couple of officers in addition. For Warhammer that's a big old unit or two units of 12. For Sharply Buffed I can have 3 units of 8, enough to give a player at the club an whole cavalry wing as his force for the game. 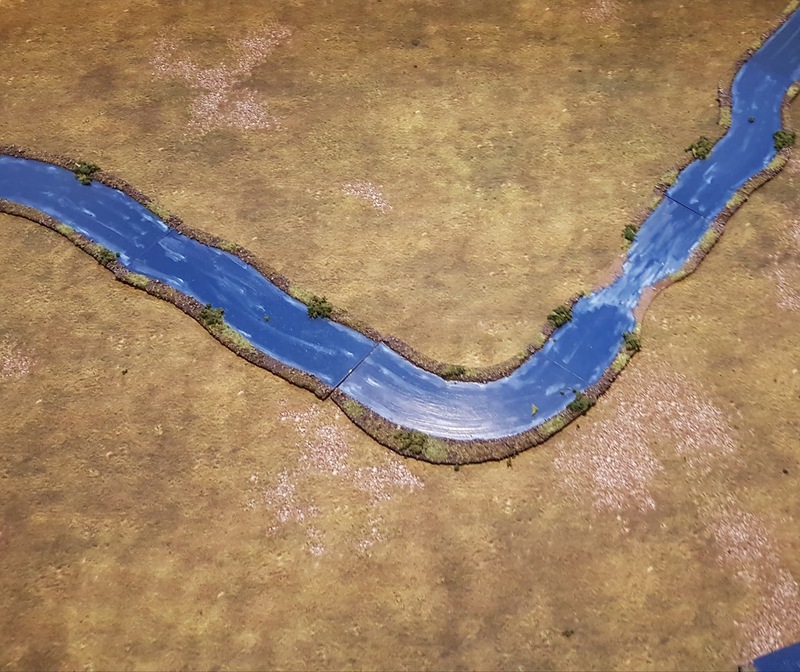 In addition to the donkey wallopers, I also tarted up the river sections I bought at Salute last year. I cut one of the straight sections down and created a ford, every river needs and addition crossing point! I then used a couple of shades of blue to detail the water and to make it look a bit more lively rather than the plain Blue it used to be. 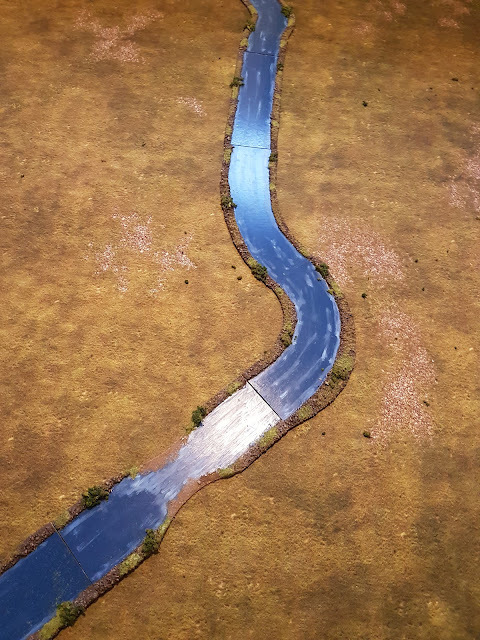 A bit of extra flock and clump foliage and its ready to stick on the table next weekend. 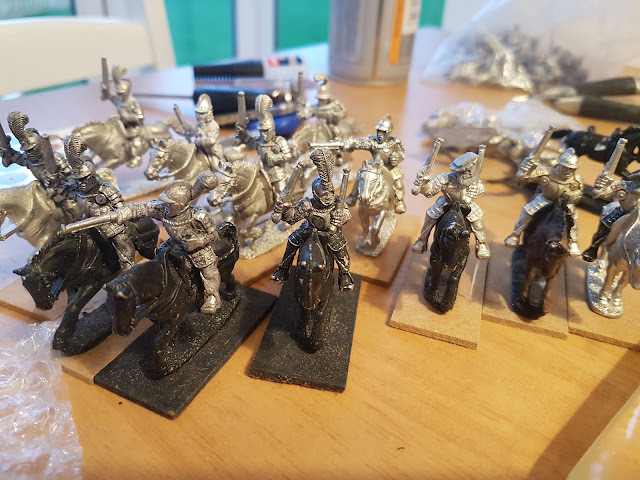 Getting these finished means that I have a bit more time to squeeze in another fantasy unit before I pile back into historical stuff (Russians for February's game) after that. Keep your eyes peeled! Great work on the Pistoliers, great idea with the front rank horses, I think I'm going to get myself some. 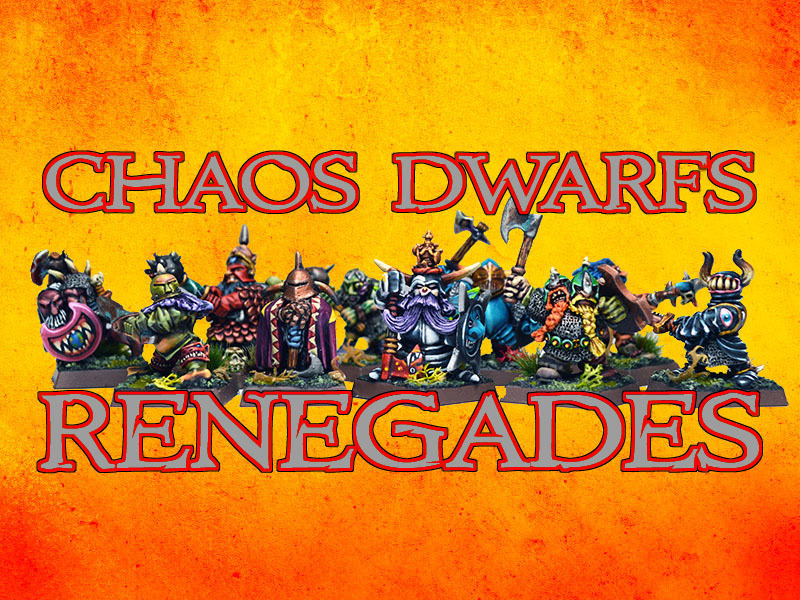 A very impressive looking unit, even more so because you rattled them out in next to no time! The yellow feathers are a great touch to add some jazz! I really like those schwarz ritters, great work! Oh I really like the piebalds, and the yellow and orange feathers really set them off. You've knocked these out in no times as well. Quality output man! Very nice indeed. 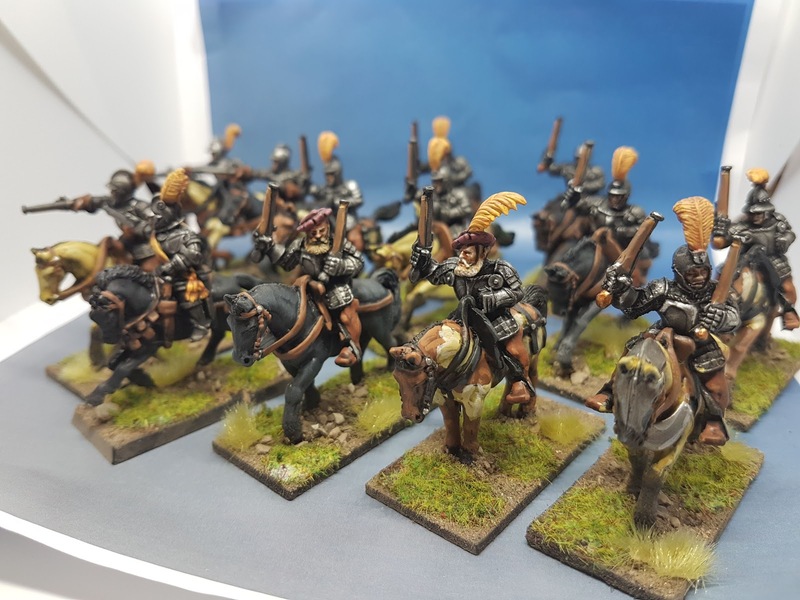 I had been wondering if the Front Rank horses would fit with Warhammer figures so it's good to see that they do. Great work! 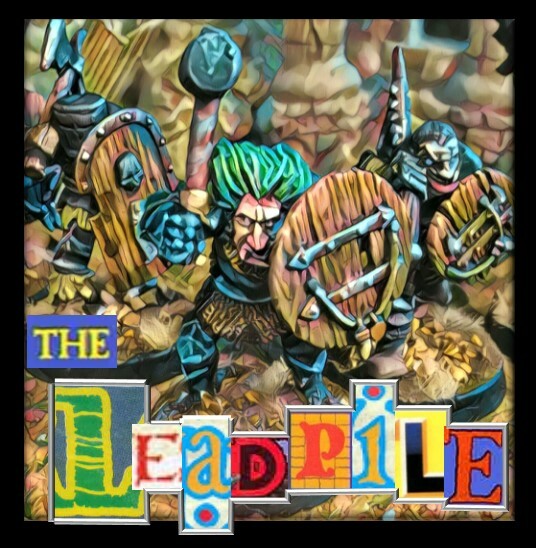 Great work my friend, looking forward to seeing your next Fantasy offering. Great start to the year. I need to break the seal on the first painted of the year.